"Sometimes the male ego is useful." ...But late last year in 2014, he decided to change. And start a life-changing weight loss adventure. He started at 122 kg on the 1st of October 2014. Six months later, he tipped the scales at 96 kg. This is the story of how my friend, James, lost 26 kg in 6 months. And raised RM10,000 (USD2,857) for charity along the way. I’ve known James for more than four years now. The first time we met, I immediately noticed two things: he was fat, and he loved to eat. He loved food, and by the looks of it, food loved him too. We were members of a Rotaract club — so we hung out in a group often. Whenever he was around, food was involved. It wasn’t salads and cereal either. 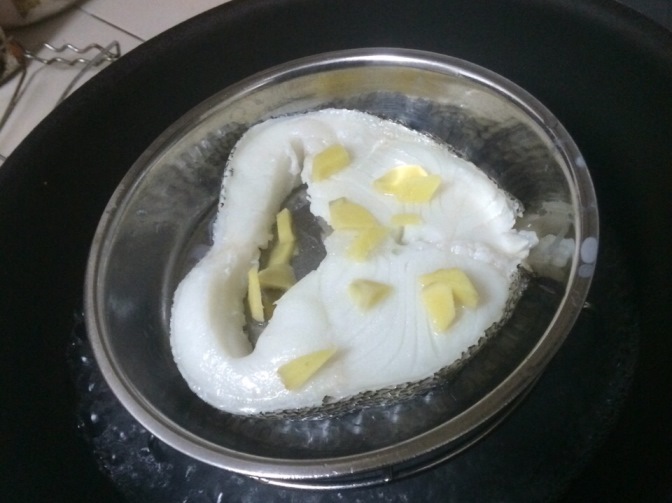 It was usually fried, fatty, oily food. The type that your typical Malaysian loves. 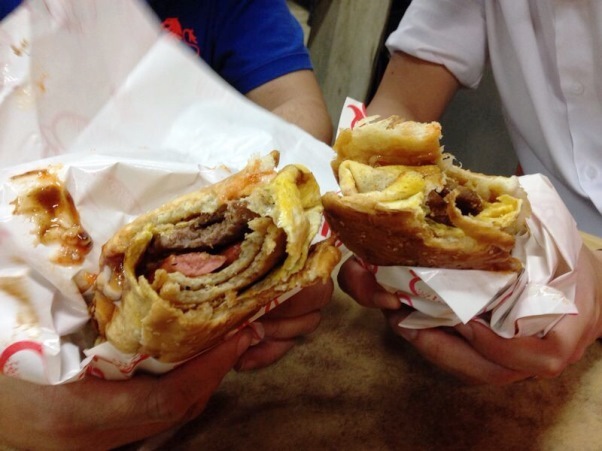 James’ Favorite: Oblong Ramlee Burger. Double. James hadn’t always been fat though. When he was younger, he was slim. He only started putting on weight in high school. And then he got consistently fatter over the years. James seldom kept track of how much he weighed, but he knew he was expanding – because his clothes kept getting tight. But except for one attempt where he managed to lose 10kg (only to gain it all back), he embraced being big. And kept buying new clothes every time he couldn’t fit the old ones. Things culminated late last year, when James fattened up to his biggest size ever. Even close friends started commenting about how much weight he had put on. "Every Kg you lose, I'll donate 10 bucks to charity"
“Yeah, right…” a skeptic threw back. “I’ll do it too. Ten ringgit for every one kg,” I chipped in. Then another friend pledged. And another. By the end of that conversation, we had assembled a group of willing pledgers. We were going to literally pay for his weight loss. James set his target at 10 kg. “But wait, you’ve got all of us risking our money James. What if you fail your target? What’s your punishment?” the crowd asked. Sometimes the male ego is useful. One of our Rotaract members always dreams big. Let’s call him PP. PP saw potential in what had just happened in our Whatsapp group. So he proposed to expand the project: make it public, and have our Rotaract club organize it. It was approved. The club set up a campaign called #10for1KG — asking people to pledge to lose weight — and other people to give money to charity based on the weight loss. Anyone could sign up. The club would just track progress and keep people accountable. The campaign was a huge success – 24 people pledged to lose weight, and many others to donate money. We let donors choose the charity they wanted to help. As long as it was for a legit charitable cause. James was the star of the campaign. His pledges officially came up to RM 396 per kg. 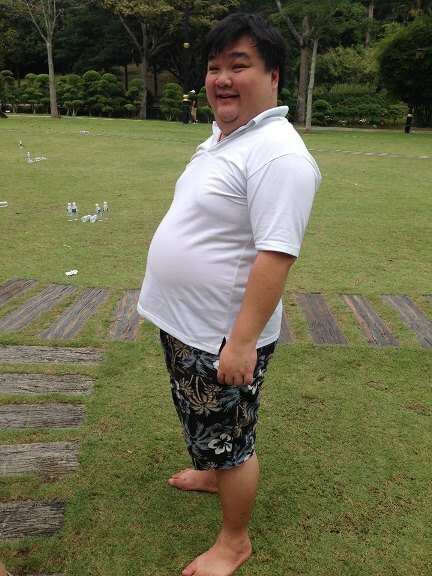 If he lost his target of 10 kg, he would raise almost four thousand for charity. But of course the male egos kicked in again. It wasn’t enough to just raise money for charity. “And if I don’t?” asked James. “Most people think getting fit is a lot of cardio, some weight training, and a little dieting. It’s not. It’s lots of clean eating, some weight training and a little cardio.” – Adapted from Physical Culturist. To design his weight-loss program, James turned to a trusted friend, who freelances in fitness training. It was a program based on Leangains, Intermittent Fasting, and Carbohydrate Cycling. – No food during the 16 hours of fasting – only water. – Skipped breakfast. Meals were usually lunch, a pre-workout snack, and dinner by 9 pm. – No limits on amount of food during “feeding window”. As long as it was healthy food – ate as much as he wanted! – The theory behind Intermittent Fasting is that the human body enters a “fasting” state once you haven’t eaten for about 12 hours. In this state, the body burns stored fat for energy. Which is what we want. But if you’re constantly eating, your body just burns the food you eat – and your excess fat never goes anywhere. – Examples of carbohydrate-rich foods: rice, noodles, bread, pasta. – On non-gym days (Mondays, Wednesdays, Fridays, Sundays), ate mostly vegetables and lean meat (e.g. fish and chicken). – No limits on amount of carbohydrates during gym days. Ate as much as he wanted. – The theory behind Carbohydrate Cycling is that the human body burns fat (both in the food you eat, and the stored fat in your body) when carbohydrates aren’t available. – On gym days, carbohydrates are needed for energy to lift weights and to help build muscle. So eat them then. – On non-gym days, since there’s no heavy weight lifting, stop eating carbohydrates. To encourage the body to burn fat. Non-gym day vs gym day lunch. Rice only on gym days. 3) Drank 4 liters of water every day. 3.5 liters on non-gym days. – Ate as much of whatever food he wanted on these days. – Had an average of 5 cheat days a month (usually when entertaining guests). James doesn’t have time to cook. So he ate out most of the time. In an ideal world, we would all prepare healthy home-cooked meals. But James has shown that you can still eat out, as long as you make healthy food choices. "In my first week of working out, I nearly died," – James. 1. Compound weight training using barbells. Three times a week: Tuesdays, Thursdays and Saturdays. 2.45 minutes – 1 hour per session. Sometimes added on 30 minutes of cycling at the end. 3.Focused on the three main powerlifts: Squat, deadlift and bench press. 4. In the first month, started with 5 sets of 5 repetitions (5×5) i.e. squat 5 times (1 set), rest a few minutes, and then continue until 5 sets are reached. Then move to the next powerlift. 5. From the second month onwards, did 3 sets of 5 reps (3×5). And only one set of 5 reps for the deadlift (1×5). 6. Every time he could complete all sets comfortably, he increased the weights on the bar: 5 kg increase for Squat and Deadlift and 2.5 kg increase for Bench Press. 7. Started alternating bench press with overhead press from the 3rd month onwards. 8.Started doing negative chin-ups. (Hint: it’s a great exercise for people who can’t do proper chin-ups yet). If you’ve read about powerlifting before, you’ll recognize the above routine borrows very heavily from Starting Strength and StrongLifts 5×5. Both James and I are strong believers in these programs. They give you amazing results for very little time spent. When he had time, James also sometimes swam for 30 minutes on non-gym days. But the core of his exercise program was barbell weight training. I don’t think so. I believe the most efficient way to lose weight healthily is to modify your diet and lift heavy weights2. Cardio can just supplement that. "When it first started, it was just a stupid bet..."
1. In the first week, James lost 4kg. (His trainer told him not to get too excited though. It was mostly from water retention). 2. After 1.5 months: 10 kg. His shirts fit properly now. 3. 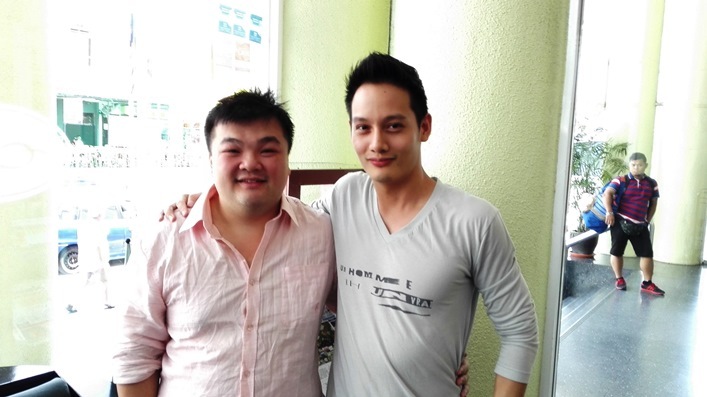 By the end of 2.5 months, James had lost 17 kg. 4. Unfortunately in month 3, James had to do undergo minor surgery. This made him unable to hit the gym. I won’t give you the gory details here, except that James learned the hard way — he needed to eat lots of vegetables for fiber. It helps when going to the toilet. 5. While recuperating from surgery, James got caught up in charity work with Shelterbox. So that threw his workout schedule out for another month. 6. He finally got back to his schedule in month 5. And lost another 4 kg, bringing his total weight loss to 21 kg. By 1st March 2015, James had vastly outperformed his initial goal of 10 kg. He was now just chasing the 25 kg target set by our friend PP. A target that would have made the difference between the streets of Kuala Lumpur seeing Barney and the Pink Panther. He needed to lose another 4 kg in four weeks. But of all the months of James’ weight-loss journey, this was the most difficult. For some reason, his weight plateaued. It wasn’t going down at all. James went into panic mode: Except for four cheat days, he totally eliminated carbohydrates (even on gym days), and ate super clean food (i.e. steamed fish and vegetables every day). He forced himself to swim every non-gym day, instead of doing it happily in his free time. It was stressful, and he was constantly tired from having no carbs. Could you eat this every day for a month? Eventually he lost 5 kg, bringing his grand total to 26 kg in 6 months. If there’s something we can all learn from the final month it’s this: No matter what self-improvement plan you’re pursuing, it’s OK to work hard. But if you’re making yourself extremely miserable – understand that you’ve gone too far. Progress should be consistent and pleasant – not drastic and depressing. Because this kind of progress is unsustainable. You might get to a target fast – but you’ll be unhappy and slide back to your old ways. It’s OK to be gentle with yourself. It’s more sustainable that way. Not too expensive or time-consuming right? 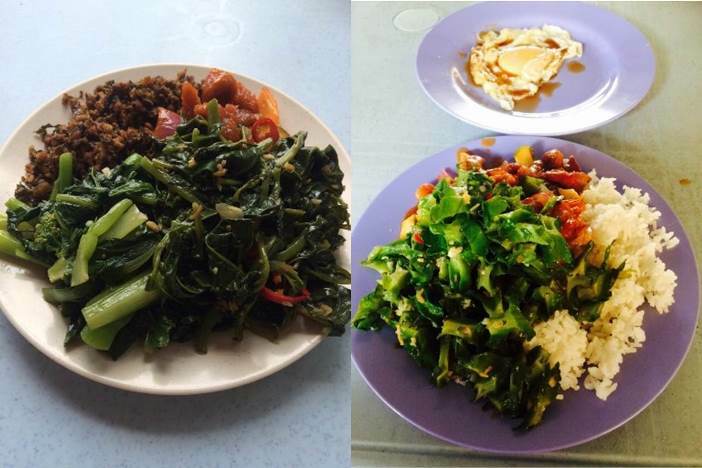 But even better, due to his modified diet, James now spends about RM 200 per month less on food. More than enough to cover all his gym expenses. Not only is he getting fitter, he’s getting richer too. James continues to follow his diet and workout routine (the sustainable version). He intends to lose another 20 kg. I believe he will. By the end of 2015, we will probably weigh the same. On the night of 11th April 2015, the Pink Panther walked through one of the busiest nightlife areas in Kuala Lumpur, flanked by half a dozen ladies. James had made good on his promise, and so had he. Pledgers started banking in their donations. The full collection will total about RM 10,000. 78% of that money has already been collected and sent to help the earthquake survivors in Nepal. When the remainder is collected, it will help fund a school in Malaysia. The full article originally appeared at mr-stingy.com. You may not have heard of Nerdook before. But I think you need to. His is a story worth listening to.